Welcome to the voting round for Best Breakout Blog! Voting will last exactly a week, from today, July 25, 12:00 AM EST, to August 1, 11:59 PM EST. There will be a poll at the end of this post where you can vote, and please only vote once! Thank you, and keep scrolling for the second category, Best Trending Blog! I am very excited to be nominated for Best Breakout Blog! When I first started The Book Stop, I never thought I'd make so many bloggy friends and be welcome into the blogging community with such open arms and friendliness! All I can say is thank you so much, and I know that my blog can only get better! "It's so easy to forget that Jack has only been blogging for three months! I mean, he's like the blogging guru, his reviews are extremely professional and he blends so effortlessly into the blogging community. Not only does he have so many views, followers and email subscribers, but he has so many blogging friends... Jack really is like that new kid at school who instantly clicks. And not only does he just fit into the blogging community, but across these four months he has brought so much more to the book blogosphere! The Book Stop has been such a success so far and really is the definition of a "breakout blog"; if I hadn't known Jack from practically day one, then I definitely wouldn't believe he's been blogging for such a short amount of time! There are so many reasons why The Book Stop has been such a hit – way too many to list – but I think one of them is that Jack is a male blogger who represents the teenage boy's view on reading. His blog has gained so much popularity in such a short time that I KNOW he can only get better ;)"
"When Jack at The Book Stop hit the blogging scene in April 2013, the bloggerverse gained a new shining star. What makes Jack’s site a Breakout Blog? Most importantly, he puts his readers first. Since The Book Stop’s inception, Jack’s made several changes to create the most solid platform to reach his followers. Because of his attention to detail and his passion for books, he managed to fashion a blog that pulls in more and more readers every day. Jack also uses his creativity to connect with more people. For example, he recognized the dystopian trend and devoted a whole month to that subgenre. He collected authors and other bloggers to run pieces and also drew in interest with a book giveaway. And not just any giveaway, he offered both print and eBooks to appeal to the wide variety of reading styles. Finally, Jack burst onto the Twitter scene too, making friends with people left and right, and those contacts bring more people to his blog. So, look out internet, Jack and The Book Stop are taking over! Vote for The Book Stop for this year’s Breakout Blog!" "The Book Stop is an awesome blog that has honest reviews and totally cool features like Dystopia Month! Jack is a great friend and fun to talk to!! Plus he's IRISH!!! How awesome is that! He's super nice and I'm glad to have met him. The Book Stop and Jack has done so well in the blogosphere especially since he's only been blogging for 4 months! I absolutely adore The Book Stop!" Thank you to everyone who nominated me for this award, and even those who didn't! I'm sure all of us in this category can agree that being nominated for such an award when being "newbies" in the blogging world is a huge honor. I feel like this is even more true when it comes to my blog, A Bookish Heart. While my blog fits the basic requirements of most book blogs with reviews, discussions, and meme participation, I also strive to include original content. A Bookish Heart has numerous unique features that I have created in hopes to appeal to different readers, including Bookish Finds, Bookish Friends, and Bookish Life, among many more. My hope is that my blog can be a place where people get can get together to chat about books, show their appreciation for one another, and have an escape from the constant barrage of reviews, tours, and promos that are seen around the blogosphere. This nomination is a confirmation that I am still a valued member of the community even though I operate slightly different. So thank you again, to those who nominated me and those who didn't, for accepting me in the community. A Bookish Heart went live on March 2nd, 2013, which means it's coming up to it's five month anniversary. I cannot provide how many unique pageviews my site has because I do not utilize any tool to keep track of this information. (Doesn't everyone always say to avoid the numbers game?) In regards to followers, I have 23 Wordpress followers, 41 email subscribers, 152 Bloglovin' followers, and 40 feed subscribers. Honestly, none of that matters as much to me as the amount of comments I get on my blog which usually ranges from 10-30 comments on each post (and I respond to each and every one of them)! First off a big thank you to whomever(s) nominated me, I’m chuffed! 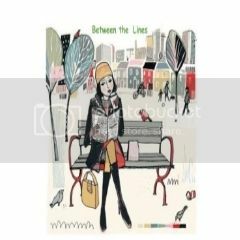 Between the Lines started as a whim on 1st March 2013 and grew quickly in to an absorbing, fun hobby. I describe my blog as bookish thoughts from an Irish dedicated follower of fiction. I’ve always been passionate about books and through my blog I love sharing my opinions and views on all things booky. And best of all building new friendships through comments on my blog. Remember, voting will last a week! Please don't cheat :) Good luck to everyone!